Some of those smart minds over at the University of Rochester got together and published a little study for us to talk about this week. Those psychologists, tinkerers of the brain I call them, have learned gamers don't always need gore. The original article can be found in the show notes for your enjoyment. Your input on the subject is always appreciated, feel free to answer some of the questions we have for your below if you need some inspiration. - How often do you notice gore when playing a game? - When is violence and gore excessive? - Would you miss the gore if taken out of traditionally violent games? - The University of Rochester study. I've been playing Fallout 3 as well, and I've been thinking a lot about the violence in the game as well. Unlike you guys (sorry I didn't connect names with voices, so I can't remember who specifically said this), I do feel like the violence in combat was comical in the Kill Bill way, but I also feel like there are two levels of violence acting in the game. My girlfriend (who loves games like Viva Pinata and Lego Indiana Jones) has been watching me play Fallout 3 a lot, because she's interested in the story, and I said to her (right after I knocked someone's head off with a sledgehammer), that I was surprised that the violence wasn't putting her off from watching, and she replied that because it was so ridiculously unrealistic, it didn't bother her at all. A few days later, though, she saw the super-mutant gore bags and a raider hideout (with the dismembered bodies hanging on hooks), both of which freaked her out. For myself too, I chuckle every time I see a raider head spinning away in slow motion. However, on beginning the game as an evil character after having beaten it with a good character, the same violence really emphasizes the moral consequences of the violent paths that are open to me as an evil-doer. Lucas Simms's head spinning away in slow motion just made me feel bad, to such a point that I am actually playing two concurrent sessions of the game, one as a good player and one as an evil character, rectifying my own evil actions by replaying the same stories with the good player. Wow, very cool study. And an intriguing discussion. Violence not equals Gore - Well, here in Germany this is a topic that has been discussed over and over again. Generally, there is a widespread anti-games sentiment going on here. Games are generally seen as violent and malicious for children and adolescent. So games are actually censored by the government. We often get cut and altered versions. There is a government bureau checking all new releases, making a judgment on its violence content and requiring the developers to do specific changes to tone it down or else they will be banned. The criteria for censorship is "Gewaltverherllichung" which translates into Violence-glorification. And yes the changes they require are often purely cosmetic. They cut down the gore. We often get robots leaking oil or even zombies with green blood instead of humans with red blood. Even in a game like Command & Conquer, the red pixels have been re-colored. We had a Counter-Strike version where enemies wouldn't die but get on their knees with their hands behind their heads. The reasons for censorship are sometimes more subtle. In Call of Duty 4, the whole arcade mode was taken out. Having points pop out at every kill in a realistic war scenario was too sarcastic, I guess. As for the games you've mentioned: the German censorship matches your judgement. Halo 3 wasn't censored at all. 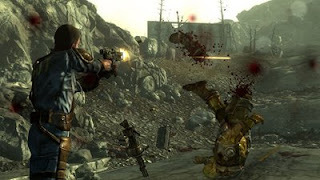 In Call of Duty, Bioshock and Fallout 3 the gore has been reduced. Gears of War is BANNED all together because the required changes were too severe for the developer to handle. There are even some very stupid things: the German version of Resident Evil 4 Wii isn't censored so much as far as the gore goes. It misses a lot of the special features (extra levels) however because the bureau didn't receive a test version for the new features and therefore banned them by default. Great episode guys. I really enjoyed the conversation. I especially appreciated your point about different levels of gore setting a scene or creating an specific aesthetic for a game. This is a great way to explain to someone who's under the impression that violence in games is always mindless and unnecessary. Like you said, violence isn't always necessary to create an immersive experience, but some games wouldn't be the same without it. I'm interested to hear which path you ultimately find more satisfying. Wow, I had no idea the German censors were so strict. Do you think this will change in the future as the old guard of politicians fades away and a younger group takes their place? Do you ever import games so you can play them, or at least see them the way the designers meant for them to be seen? Thanks for the kind words. It's frustrating that people see violence in games as an end rather than a means, so a story like the one we discussed is always heartening. Keep up the good work on your show, btw :-).